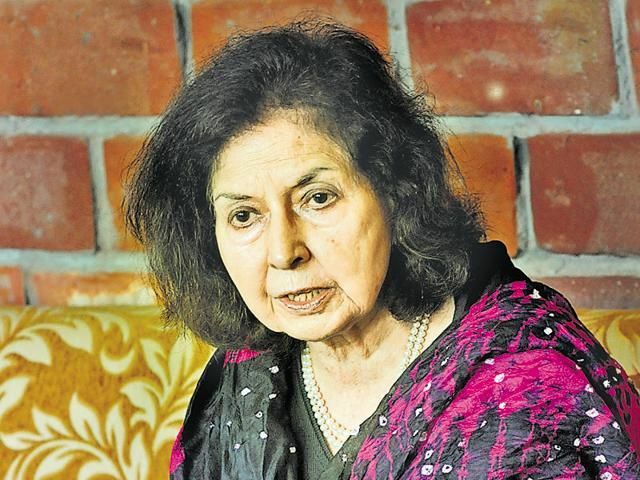 Kolkata : India doesn’t need any lessons on nationalism 70 years after Independence, feels eminent writer and member of the Nehru-Gandhi family Nayantara Sahgal, dubbing the BJP’s nationalism agenda a “load of rubbish”. “We do not need nationalism. Their (BJP’s) idea of nationalism is a load of rubbish. We needed nationalism when we were fighting to become a nation, fighting to free ourselves from British rule. We are a nation for the past 70 years. So we do not need nationalism. It is all nonsense,” Sahgal said in an interview to IANS on the sidelines of the Apeejay Kolkata Literary Festival here. The nonagenarian writer, who was one of the most prominent faces of the 2015 “award wapsi” campaign to protest intolerance in the country, said India is going through a dark, grim phase with no democracy. Art and artists are frequently under attack and nation’s history is being tampered with. “We are in a dark situation in India. There is no democracy. We are already seeing signs of that because debate and dissent have been crushed. History is being wiped out and being re-written. Filmmakers are being attacked. Writers are also under attack. Many have been murdered. So what else can you believe,” she asked. Sahgal feared that, at this rate, the Hindutva brigade would declare India a “Hindu Rashtra”, where all other communities would be considered outsiders and the Muslims regarded as enemies. Sahgal, whose new novella “When The Moon Shines By Day” chronicles the country’s journey towards “a fascist Hindu reality”, maintained it is not just the intellectual community, but people from all walks of life are under attack. “It is not only concerning the intellectual community. It is the common person who is under attack. Cattle transporters have been murdered, a poor man who was a blacksmith, has been lynched by a mob, a little boy was knifed to death while returning from his Eid shopping. These are not intellectuals. These are ordinary people carrying on with their ordinary business,” she pointed out. Sahgal, the daughter of first Indian Prime Minister Jawaharlal Nehru’s sister, Vijaya Lakshmi Pandit, said despite their defeat, Congress’ performance in the recent Gujarat elections is a sign that the situation in the country is changing. “The Dalits have risen in protest. They have declared they would not pick up the cow carcasses any more. It is from the different groups from all over the country that the protests are arising,” she said. “The real change ultimately comes from the votes. But now all the opposition parties — and many Indians who do not belong to any party — are suspicious about the EVMs because they have been tampered with,” she alleged. “The BJP would go to any length to win elections. Of course, they have a lot of money because the corporates are backing them and the opposition parties cannot compete with them on that front at all,” Sahgal added. Shiv sena chief Uddhav thackeray demands reservation for the Dhangara’s, Muslims and other communities.